Earlier I wrote about the interior design of La Bandita Townhouse. 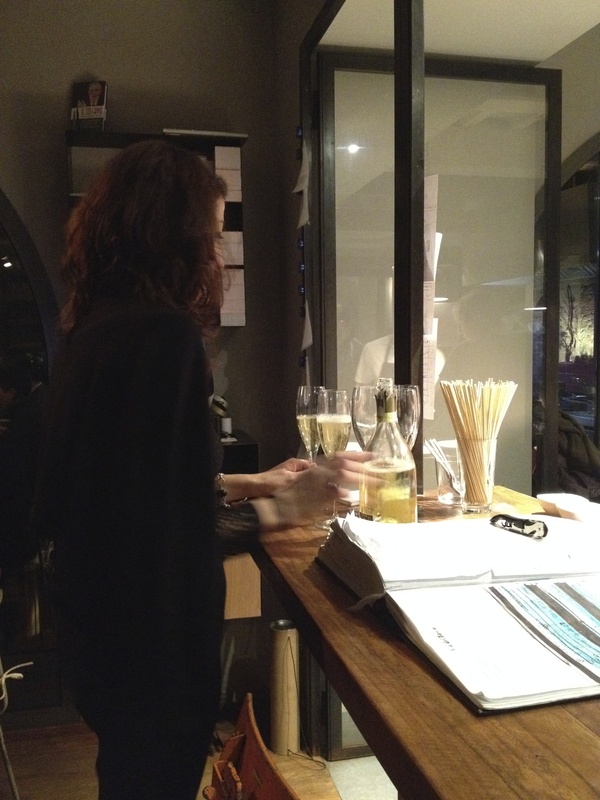 Clearly the owners, John and Ondine, have put as much thought into the service as they did into the décor. From the first email to book my room, until the day I left, the service was (as the young folks say) on fleek. This is something I do not take for granted. Unfortunately, too many people have no idea what it means to work in the hospitality business. Why they would open or work in a hotel/restaurant/spa, etc. is beyond me. 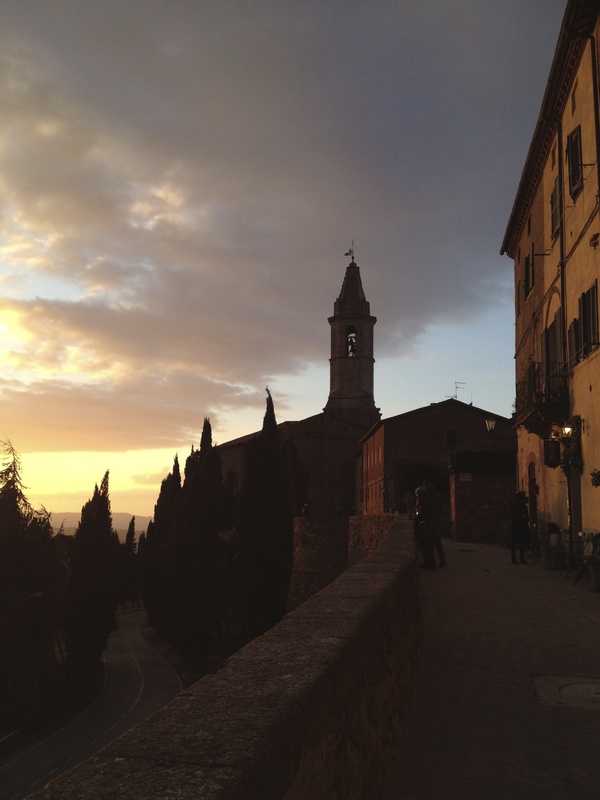 Pienza is a small hilltop town with a population of approximately two thousand people. It was the birthplace of Aeneas Silvius Piccolomini, who would become Pope Pius II. Piccolomini rebuilt the entire village, starting in 1459, after he became Pope. He saw it as a lovely Renaissance retreat from the Papal capital. In 1996 Pienza was named an UNESCO World Heritage Site. It’s a perfect base from which to explore this region of Tuscany (with a car). Montapluciano, Siena, and other towns are close by. 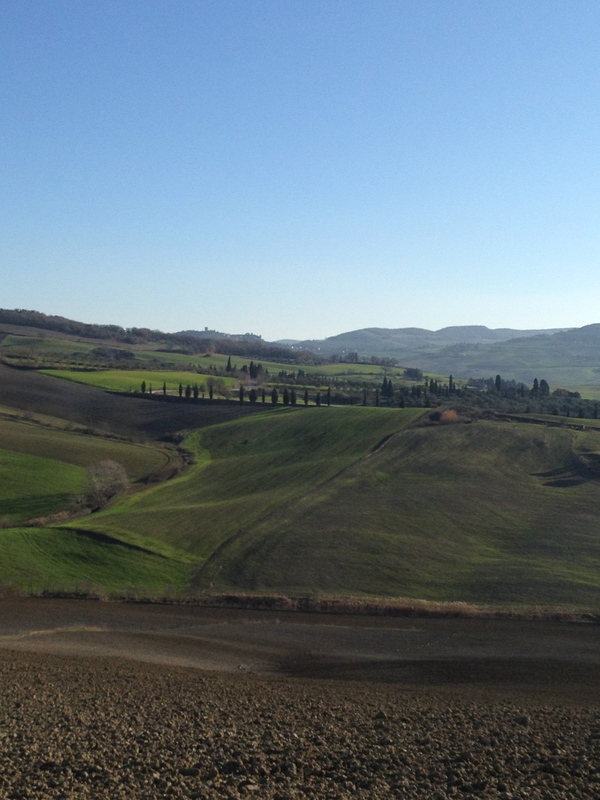 If you’re a Pecorino cheese fan, a visit to Pienza is a must. Since I was only staying for two nights, I didn’t rent a car and spent most of my time close to the Townhouse. It was FREEZING. I’m not exaggerating. I haven’t been that cold since my days at Syracuse University. 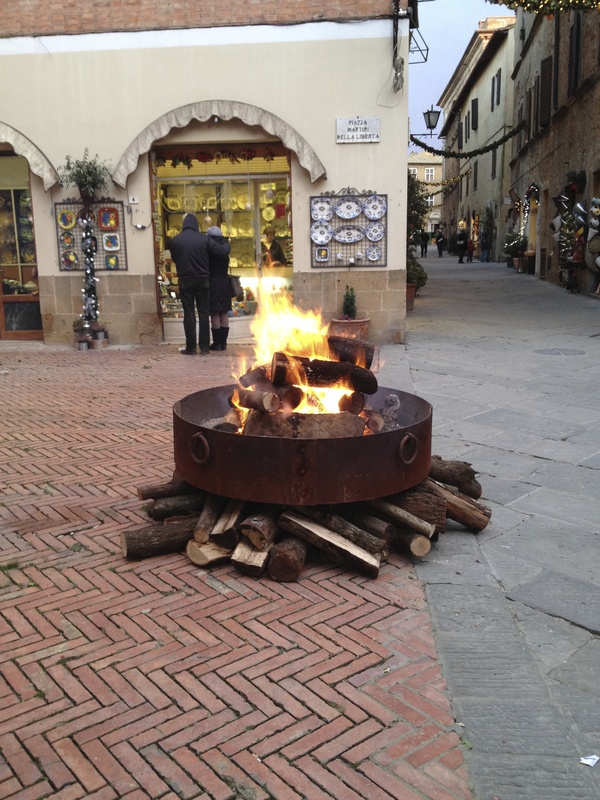 I was elated to see these fire pits around town. I love how in this country even a simple and functional thing, like a fire pit, is well designed. I mean, look at the darn logs. Did the person who built the fire make sure they were “just so” or what? Also, as I said before, it was beyond freezing. Who has time to worry about aesthetics in sub-freezing weather? If the logs were janky, would the fire builder be called out? I truly appreciate this attention to details. The views were spectacular. Sunset. Sun rising. View as I started my epic walk three and a half-hour walk. 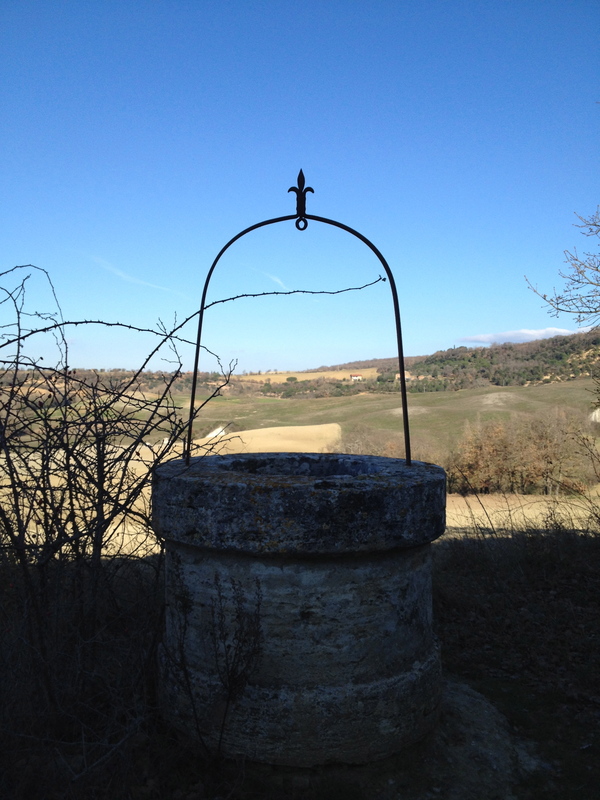 The top of this well, stylish simplicity. Pieve dei Santi Vito e Modesto Church. It was built sometime during the 11th and 12th centuries. 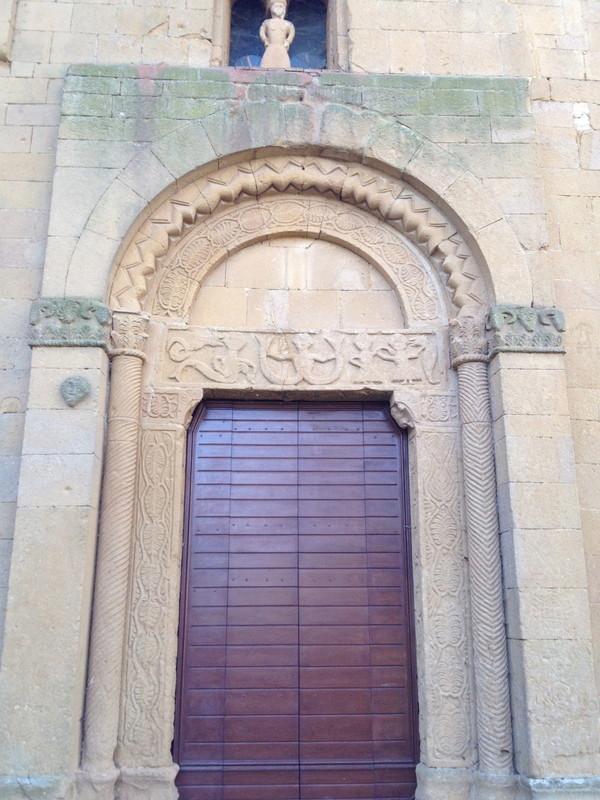 Notice the distinctive carvings above the door. Several of these small country churches were built above Etruscan sites and used some of the same imagery. 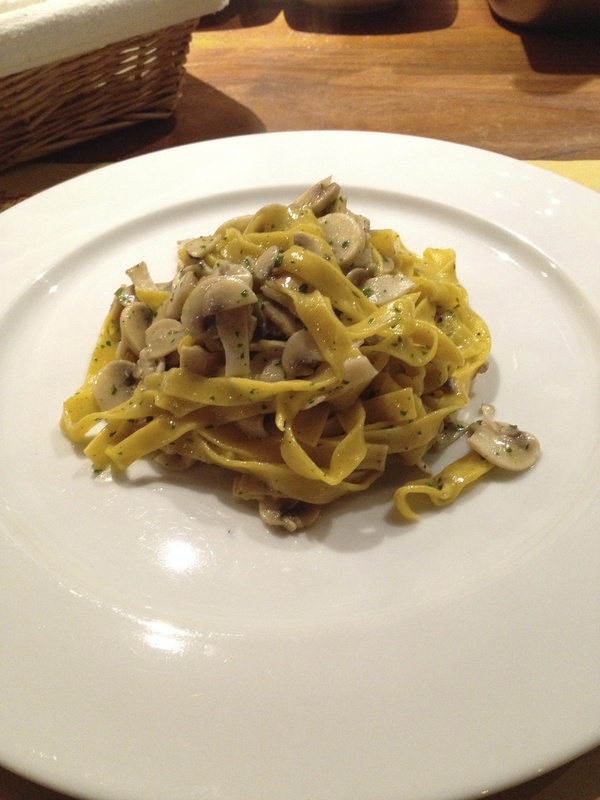 I had a fantastic dinner at the hotel, after I defrosted. The restaurant is open to the pubic (you need reservations). Chef David and his sous-chef, Jacopo, knocked it out of the park. 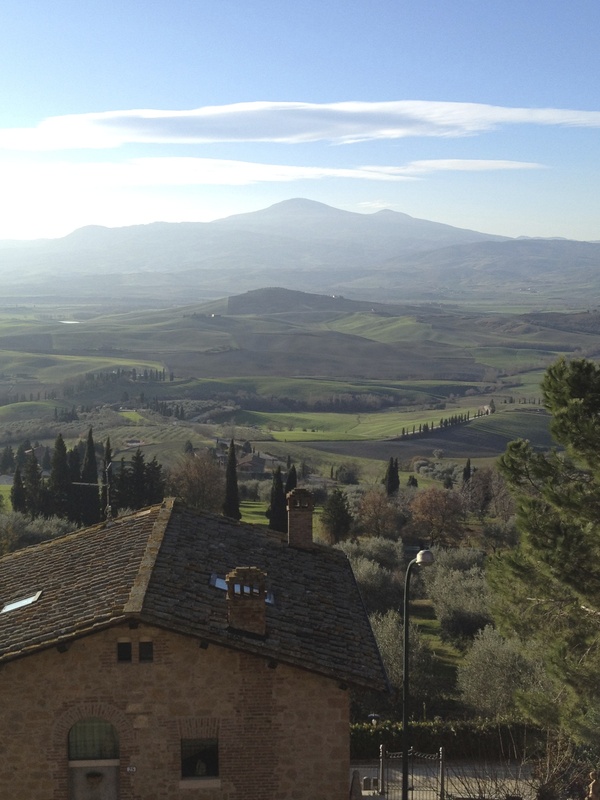 During high season, Pienza is very popular with tour groups. This charming video about La Bandita and Pienza helps explain why. A big Thank You to everyone at La Bandita. Sometimes it’s not so easy to travel alone and they made me feel at home. Photos: Me and my iPhone. It does look so lovely there. Glad you had a nice getaway. Off to read about the interiors now ! It is (even when it’s freezing). I’m looking forward to re-visiting in the Spring or Summer. Beautiful pictures, video and write up of a town I never got to visit. Beautiful photos and your post made me giggle as we too recently found ourselves on a walk in the Sabine hills and got mildly concerned when we saw a sign which basically translated as ‘Beware of the wild boar’…we were soon running back down the hill when we heard a rustle in the bushes! ahaha! I know what you mean. During my walk, I was wondering if I could outrun a boar. Uhm, probably not. Oh it’s gorgeous. 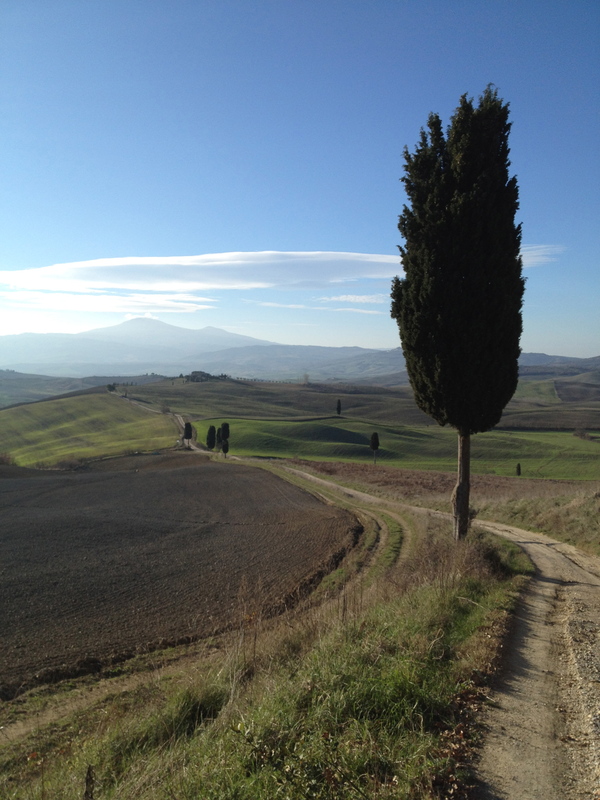 I continually dream about running of to Tuscany to live! However, I can do without the cold… and I guess the summer too! Haha. I went to the Tuscan coast during late August a few summers ago. It was lovely but only because I was by the sea. I bet inland it was blazing hot!